In the morning of August 10, Russian security officials conducted a search in the house of a Crimean Muslim in the village of Novoklenovo, Belogorsky district of Crimea, after which they took all men from the family. Four Muslims, detained in the morning of August 10 in the village Novoklenovo in Belogorsky district of the Crimea, may face deportation. Lawyer Emil Kurbedinov shared such an assumption in his comment to QHA. He noted that the family of detainees is from Central Asia. "They detained a father and three brothers, as far as I know. I suppose that the issue of deportation and their extradition to Uzbekistan or Tajikistan (I do not know where exactly they are from) is probably the question. I suppose that they were persecuted there for extremism or membership in Hizb ut-Tahrir, they were put on the wanted list and now they were found in the Crimea. I think that this is due to their religion, because they are all observing Muslims," the lawyer said. Emil Kurbedinov noted that information about where the Muslims were taken is being clarified. 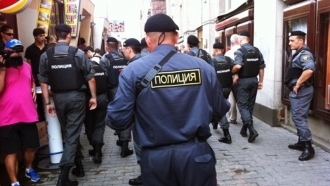 Earlier, in the morning of August 10 in the village of Novoklenovo in Belogorsky district of Crimea, Russian law enforces blocked one of the streets, where a search was conducted in the houses of the Crimean Muslim. After the search, Russian security forces took away all the men from the family.